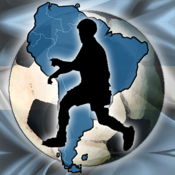 easySoccer, acclaimed 2d soccer game for iPhone/iPad, now meets Copa America! A slim, special edition, with the twelve teams and and the exact tournament mode of this important competition, that will let you support your South American soccer love, playing with your favorite pocket device, or with your new tablet. A note: compared to the full standard version, easySoccer Copa America come with no bluetooth/player vs player support, nor any GameCenter capability.